Over eight years ago, we started extensive testing of original Edison battery components. We learned from years of investigating and experimentation to produce batteries of our own design. Different than Edison's, they can be discharged and charged endlessly with no degradation over time. 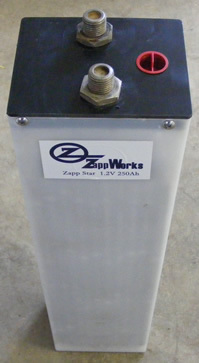 While the lead acid battery permanently loses capacity with successive use, the Zapp Star Battery never loses capacity. If the user completely drains the lead acid battery, capacity is severely diminished or often destroyed.After complete discharge, the Zapp Star Battery can be recharged to 100% capacity. Lasts 100 years with 2% degradation. Compare this with more expensive deep-charge lead acid batteries. Discharging to 50% of stated capacity end the life of the battery after 500 charge/discharge cycles. Best case, a high-quality deep-charge lead acid battery lasts 5-7 years. Unlike other batteries, entire quoted capacity is usable. For example, deep-charge lead acid batteries should be discharged between 30% and 70% of rated capacity--and never beyond 80%. Cannot be overcharged. It does not overheat, provided electrolyte level is maintained. A complete residential battery system stores 36 kW stoage (our 12 kW models), enough for a typical 3-bedroom 2 bath household. Performs well when charged/discharged many times a day. Potash electrolyte is plentiful and cheap. No hazmat disposal requirements when diluted.